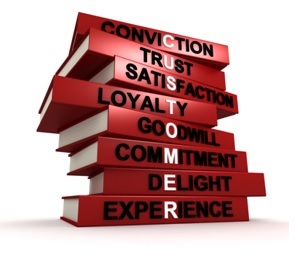 Customer centricity has become more popular or even necessary over the past few years. Companies went from a product centered to a customer centered way of thinking. They became increasingly more aware of the need to increase focus on customer related factors as perceived by the customer, such as customer satisfaction, customer service, customer loyalty and quality. In other words, the essence of the customer centric paradigm lies not in how to sell the product but rather on creating value for the customer. It therefore focuses on meeting the needs of individual customers. EyeWish is a dutch optician founded in 1934. They offer a wide assortment of high quality glasses and contact lenses. Why is EyeWish customer centric? They offer you a beverage if you have to wait and they take your coat for you and are overall very friendly. When you lose or damage a lens you can get up to 2 lenses for free each 6 months. The check-ups are free and they also send you a letter reminding you that it is time for your check-up again. Within 2 months you can return your glasses if you are not satisfied and you have a warranty of 2 years if something happens to your glasses which is not your fault. You can try your contact lenses for free until you have found the lens which is right for you. Your contact lenses are delivered to your home each month for free. You can make an appointment online from Monday to Saturday and you can choose your own time. The appointment will be confirmed via e-mail together with a link to change or cancel your appointment. Nespresso is famous for its coffee machines and its capsules. Nespresso is a prestige brand. This is apparent from the price of the cups, the exclusive distribution and the luxury design of the capsules. 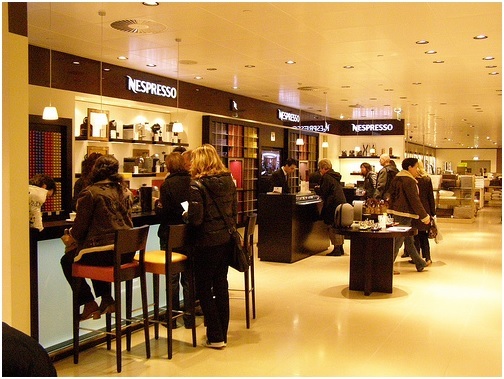 Why is Nespresso customer centric? Customers can try multiple flavors for free in Nespresso boutiques and in-store shops in the Bijenkorf to determine their favorite flavors. Another possibility is to buy an introduction package with all the Nespresso flavors. When you order this you will receive a free box to store you capsules. When your machine is defect Nespresso will pick it up from your home and return it when it is repaired. In the meantime you get a lease-lend machine from Nespresso. Order online or call the free service number and pick a suitable delivery time. Within a timeframe of two hours the capsules will be delivered at home. Nespresso charges the customer for this service (€5 from Monday-Saturday, €10 on Sunday). If you do not want the products delivered at a specific time then delivery at home is free if you order at least 200 capsules. You can also pick up your order at a Kiala-point, postnl-point or a boutique, this is always for free. Nespresso uses persistent defaults to make repeat purchases easier for the customer. 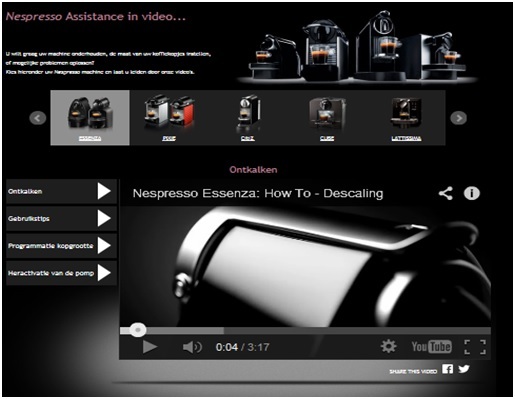 The online ‘how to’ instruction videos on the website of Nespresso are supporting the customer. Examples are ‘how to’: descale, use the machine, program the cup size and activate the pump system. Nepresso is monitoring the customer satisfaction to improve the level of support and service, enhance the brand experience. Support, before purchase, during the delivery and after the purchase Nespresso is supporting the customer. Most of the services are paid services.